Control Concepts USA launches a new line of USDA-accepted Airsweep pneumatic nozzles, designed both for promoting on-demand flow of bulk material and reducing flushing/cleaning time between batches. 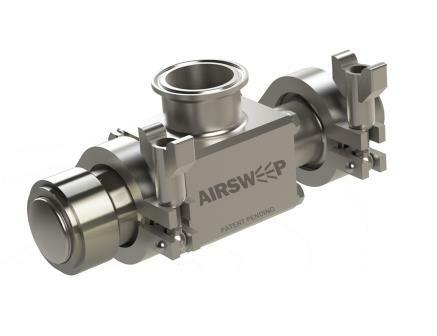 The new USDA-accepted Airsweep has been developed specifically for use in sanitary process environments. As with all Airsweeps, the latest patented model is designed to deliver quick, powerful, pulses of compressed air or gas along the inside walls of process equipment or vessels, followed by an instant re-seal to eliminate material feedback. In addition, the new model line incorporates sanitary design and fabrication principles to meet the stringent guidelines developed for dairy equipment by the USDA. The new models can be easily retrofitted onto any vessel, blender, mixer, hopper, chute, etc. - any place where flow or product adhesion is an issue. Operational features include flanged connections for quick, tool-less installation/removal from mounting and easy assembly/disassembly with simple hand tools for inspection and cleaning. All parts are resistant to corrosive products and cleaning/sanitizing chemicals.